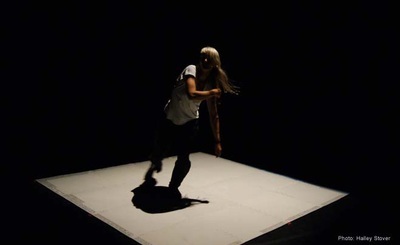 'Stillicidium - Ode to the Unimportant' from Karola Lüttringhaus on Vimeo. 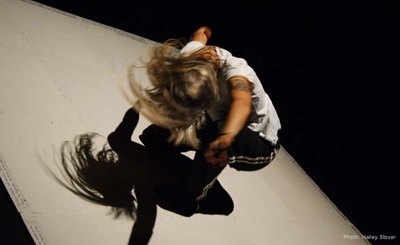 Scene design, costume, sound, choreography, concept, perofrmance: Karola Luettringhaus. Stillicidium is the term for the drip of water from the eaves of a house. The law 'servitude stillicidii' consists in the right to have the water drip from one’s eaves upon the house or ground of another. A dancer, who poses as nothing but herself, is confined by a white 8'x8' white floor. One light from above creates stark and visceral shadows on the floor. She speaks to herself and her audience during the performance, using a lavalier mic. A PA system/speaker lies next to her space, not illuminated but also not hidden in the dark space surrounding her world. One lighting change in the middle of the piece turns the white space into a greenish dark scene of uncertainty. The lights flicker hardly noticeable as the light changes and later comes back on to it's original 'comforting' artificiality.